I’m frequently asked about why there is no “Companion” rulebook collecting races, classes, items, spells, and other rules that are presently supplements. Sometimes the questioner asks for an “Advanced” game combining the current Core Rules with those same supplementary rulesets. I’ve answered this question many times, but yet it still crops up regularly, so I’m writing this blog post as a permanent answer to the question. In the 2E era of the “world’s most popular role-playing game,” one of the things that began to appear in great numbers were so-called splatbooks: rulebooks containing supplementary classes, races, items, spells, and so on, put out by the same publisher who created the original rules. The 3E and later eras of that game continued this tradition. Players would buy these splatbooks because they appealed to them, naturally, and then they would show up at a game session and tell the GM “I want to play THIS.” If the race or class didn’t fit well with the GM’s world, he or she was naturally permitted by the application of Rule Zero to say “No, sorry, I’m not allowing that in my world.” But just because the GM could do so did not mean that he or she would… the player might say, “But, but, this is official!” and the GM would feel pressured into allowing it. 3E and later books had, if anything, even more power over the GM, since that game sharply curtailed Rule Zero. One of the things I feel strongly about is that this should not happen. Players should be allowed to have a good time, of course, but the GM should never be forced to allow something he or she doesn’t want. It is for this reason that the supplements on the Downloads page will never, ever be compiled into any sort of official book, whether a Companion supplement or an Advanced rulebook. This doesn’t mean such a book is impossible. In fact, I have plans to publish my personal compilation, the Glain Supplement, in print at some point in the future. But it will not be an official Basic Fantasy Project publication… it won’t carry the crenelated border that marks all our works, nor will it appear on the Downloads page, ever. It’s my personal house rules, and house rules compilations are not permitted on the Downloads page nor as official print publications, for the same reason I just gave above. One of the curious, and very pleasant, side effects of doing things this way is the shorthand it allows the GM when starting a new game. The GM can simply say, “I’m running a Basic Fantasy game with the Half Humans, Gnomes, and Thief Options” and everyone knows exactly what options are available in that game. It’s easier to do it that way than to say “I’m running a Basic Fantasy game with just some of the Companion Supplement items. Here’s a list.” This might seem just as easy, but done this way the players may end up having to figure out what pages to print from that Companion book, or might buy the book only to use a small part of it. When our standard supplements are used, the player need only print out the supplements relevant to his or her character. This entry was posted in Development on April 15, 2018 by Solomoriah. Go read it, and then come back. This is unintuitive, clunky, not uniform, and scales oddly, implicitly preventing attributes from doing what they normally do. I disagree with this part in general; I use this mechanic all the time. Typically it’s used in places where the odds of success are normally low, and the character’s ability score is the only significant modifier. Opening doors, for example, is successful on a 1 on 1d6, with the Strength bonus added to the range of success (so a Strength bonus of +1 makes the roll succeed on 1-2 on 1d6, a +2 is 1-3 on 1d6, and so on). This is a standard mechanic in Basic Fantasy RPG. Personally, I extend this mechanic in two ways: First, an ability score with a penalty bumps the die size up (so a -1 Strength penalty makes it a 1 on 1d8, a -2 is 1 on 1d10, and so on). Second, if the difficulty is greater than normal, I bump up the die size; the best example of this is when a character tries to lift a portcullis or bend some bars. In that specific case, I bump the die all the way up to 1d20 (so a character with 18 Strength succeeds on 1-4 on 1d20, a 20% chance, while an average character has only a 5% chance of success). Skill dice discourage imaginative, descriptive play in favor of using a skill from a sheet. This assertion is not really related to his earlier statement. First, he describes how he doesn’t like “Skill Dice” as a mechanic, and then he says he doesn’t like how the mechanic affects play. They really are separate things. The short answer to the question is, how else do you do it? When I play a thief, I’m playing someone who knows how to do something I don’t know how to do (and if you ask my wife, it’s not Open Locks that I fail at, it’s Move Silently). It won’t do me any good to describe HOW I’m doing a task, when I’m doing a task the character knows better than I do. If my success is keyed to how well I can describe the action… folks, I’m screwed. And that’s not what the game is about. I do believe in rewarding players who go the extra mile. If a player says, “I check the door for traps” then I make the roll and tell the player what the character discovers (or does not discover). If that player says, “I look all around the doorknob, and before I look under the door, I want to slip my dagger in there an inch or so and slide it around to make sure there’s nothing there” then I will adjudicate that action however I see fit; probably, I’ll still make the same roll, but I might very well grant a bonus. You have to have some way to resolve actions. Keying them entirely to the character’s ability scores is very limiting; it becomes hard, for example, to have a character who is good at one part of his or her profession and bad at another. And, depending on what mechanic you choose, it may make ability scores too important (or too unimportant). So I guess I’m arguing both points too. You do need “Skill Dice” of some sort… some way to resolve actions. And you do need multiple ways to do such resolution, so each situation has an appropriate chance of success. This entry was posted in Opinion on April 4, 2018 by Solomoriah. Probably close to two months ago (in real time) I was needing a game-time-filling side quest for some of my player’s characters. So an NPC told them a story about Thaumerion Daelant, a wizard dead for almost two hundred years; his tower, they were told, had been raided repeatedly by adventurers over the years, but no one ever found the wizard’s personal treasures. Besides his spell books, a thing always worth having, the stories told that Thaumerion had been the owner of a Staff of Power. That was enough of a hook to get them moving. I didn’t have the tower detailed yet; indeed, all I knew about it was what I just wrote above. They spent a session traveling overland to the locale, and still I didn’t have the dungeon done, but no problem… I just put J.D. Neal’s Insect Valhalla from our AA1 Adventure Anthology 1 multimodule between them and the tower. I’d wanted to run that adventure for a while anyway, so it seemed like a perfect time. They finished it (as in, got from one side to the other) in a session, and due to scheduling issues I had a month to get the tower done. A week ago, I still hadn’t done anything, and I knew I was down to the wire… they were literally at the outer door of the tower. I had to get it finished. Tuesday I was driving down the road on the way back from visiting a customer, thinking about the tower, when I suddenly saw it all in a kind of a flash… how to build the dungeon so it could be repeatedly looted and still have significant challenges, and present an enemy who is not what it appears to be at all (subverting one of the oldest RPG tropes in the process). Tuesday night I sat down and drew the maps, then converted them to MapMatic +2 format. Wednesday I laid out the basic document format, wrote up a first draft of the GM’s introduction, the main encounter and roughly a third of the other dungeon rooms. Thursday I filled in all the remaining rooms, and had James Lemon start taking a look at the adventure. I’ve redone some of the maps and touched up the text a bit since then, and as far as I’m concerned it’s almost ready to publish. Seriously, I don’t normally write adventures that way. Most of the time, filling in the last 50% or so of the dungeon is a slog, and I rarely am able to fill in the mundane contents of the dungeon, or the flavor text, so easily as I did this time. Writing the adventures I publish, or revising those submitted to us, is almost always a slow process. Sometimes, though, inspiration hits… just in time, in this case, as I will be running the adventure in an hour and a half. Thaumerion’s Tower will appear on the forum soon (after my players have been through it and I fix up whatever issues they expose) and I have plans for it to appear in AA3 Adventure Anthology 3 when we begin work on that document. UPDATE: Thaumerion’s Tower is now part of BF3 Strongholds of Sorcery, which with any luck will be in print before Christmas! This entry was posted in Development, Opinion on April 30, 2017 by Solomoriah. For adventures distributed by the Basic Fantasy Project, I always require what we call “boxed text.” As a GM, I only use it sometimes, and when I do I paraphrase what’s there. Why do we require it? This fine parlor contains two large comfortable chairs toward the right rear of the room with a table between them. The table has a single drawer, and inside it is a dagger +1, +3 vs. undead. The back wall is covered floor-to-ceiling in overloaded bookshelves; there are several scrolls and one rare book, as listed below, scattered among the other books. Each turn spent searching yields a cumulative 10% chance per character searching that one will be found; the GM should roll randomly to determine which one is discovered each time the roll succeeds. On the floor is a large, ornate rug, somewhat moth-eaten but still impressive. There is a fireplace roughly centered on the right-hand wall, and that wall is covered in paintings depicting different members of the Baron’s family. Behind one of them (the painting of Hilda, the Baron’s third cousin once removed) is a small wall-safe containing 122 PP and a ring of fire resistance. The left-hand wall is dominated by a huge mirror centered on the wall; on either side of the mirror is a painting of a pastoral landscape. The mirror is, in fact, a secret door, opened by means of a slightly-protruding brick hidden behind the right-hand landscape painting. Okay, now try to read out just the parts the players can see from that description without giving away the locations of the treasures or of the secret door. Unless you are more skillful than me, you’ll naturally pause as you skip over those bits, giving away that there is something there. Breaking it apart makes it much easier to avoid giving things away, and as a bonus, you can also break up the different interesting bits into separate paragraphs so that all relevant info is easy to find. This fine parlor contains two large comfortable chairs toward the right rear of the room with a table between them; the table has a single small drawer. The back wall is covered floor-to-ceiling in overloaded bookshelves. On the floor is a large, ornate rug, somewhat moth-eaten but still impressive. There is a fireplace roughly centered on the right-hand wall, and that wall is covered in portrait paintings. The left-hand wall is dominated by a huge mirror centered on the wall; on either side of the mirror is a painting of a pastoral landscape. Inside the drawer of the small table is a dagger +1, +3 vs. undead. There are several scrolls and one rare book, as listed below, scattered among the other books on the bookshelf. Each turn spent searching yields a cumulative 10% chance per character searching that one will be found; the GM should roll randomly to determine which one is discovered each time the roll succeeds. The mirror is, in fact, a secret door, opened by means of a slightly-protruding brick hidden behind the right-hand landscape painting. The paintings on the left-hand wall (around the fireplace) depict different members of the Baron’s family. Behind one of them (the painting of Hilda, the Baron’s third cousin once removed) is a small wall-safe containing 122 PP and a ring of fire resistance. … and I can’t tell you how many times I’ve done exactly what I just did here to a dungeon room description in a submitted adventure. Usually the author of the adventure has provided all that is needed for the boxed text, but has just not organized it. Even if you NEVER read the boxed text literally, isn’t it nice to have the non-secret part boxed out for you to use in creating your own description? This entry was posted in Opinion on April 11, 2017 by Solomoriah. Why not add X to the game? This is an answer to a question I get a lot, and I’ve answered a lot… and saying the same thing over and over is inefficient. So from now on, when I get the question, I’ll point the questioner here. One of the secrets of the success of Basic Fantasy RPG is the fact that I had a clear vision of what the game needed to be. Four classes, four races, brief equipment list, manageable spell list, enough monsters to keep you busy without getting too weird, and so on. I had what I called a “coverage target,” that is, a list of things that the game had to have. I made a point of adding very little that was not on that list. The rule I used was simple. Many people would send me email messages that said “Your game is really good, but it would be great if it had X in it” where X might be sorcerers or half-dragons or whatever. Very few people repeated the same request; when I saw a request being repeated, that was an indication to me of something I should consider adding. Consider carefully, mind you… very few things got added that way. It’s why we have (brief) wrestling rules, for example, rather than none at all as was common in the 1981 era that BFRPG seeks to emulate. Any X that was requested by just one guy? No, not getting in, sorry. Even when several people asked, I was really careful. One thing in particular I am always careful of… new classes. It is so hard to create a new class that is not objectively better or worse overall than the core class it is closest to. Balance is hard, people, especially in a game that embraces the “linear fighter, quadratic wizard” situation (look it up, it’s interesting reading). The Basic Fantasy RPG Core Rules will probably never include more than the four classes and four races you find in the current edition. Keeping the game compact, and providing those “cool” bits as supplements, helps to keep the feel and style of the game consistent and familiar. This entry was posted in Development on December 14, 2015 by Solomoriah. Episode 108 of the Save or Die! podcast focused on the Basic Fantasy RPG, and I joined the hosts to discuss all aspects of the game. Click on the banner to jump straight to the podcast! This entry was posted in Promotion on May 26, 2015 by Solomoriah. I honestly don’t remember how I ended up reading Smiorgan’s post on the Department V blog, but no sooner was I reading it than I felt compelled to reply. At first I planned to post a comment there, but those who know me, know that brevity is not my strong suit. I suggest that the systemic differences among many OSR games, even the retroclones, are so profound that they exceed the community ideal of compatibility, which then must be papered over by claims of some kind of homogeneity. I know Ron is supposed to be some kind of gaming expert, but honestly, what the heck is he talking about? 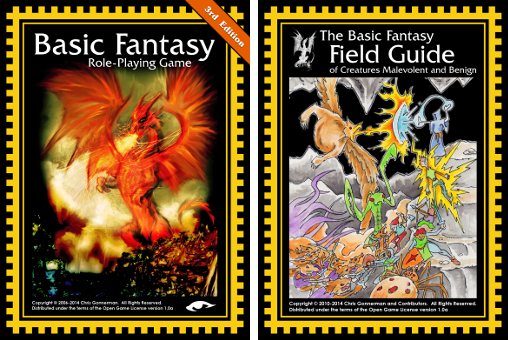 I routinely use materials (primarily adventures) written for Labyrinth Lord, OSRIC, and Swords & Wizardry (not to mention the classic games on which they are modeled) in my games, converting materials on the fly. Claims that the systemic differences are “profound” is, well, a profound overstatement. More to the point, though… Smiorgan provided a list of things he (I think it’s he) says could be changed to make D&D-like games more palatable to modern players. Let me say that I tried pretty much all of those things, and found the results wanting. I took his list of complaints, which surprisingly after more than ten years is still at the same URL, as a list of things to correct. I boiled the rules of those classic games down to a sort of mechanical ideal, “refactoring” (to use a programming term) the rules to make them more “sensible.” I addressed Mark’s list with my own philosophical statement, still available on my website. In my opinion, I did a very usable job of creating a rules-light, semi-modern game system that managed to retain D&D-isms like class and level while having a full skill system. I made an effort to make all game mechanical systems properly “first class” (in a programming sense) so that the rules would have few special cases. The game was not satisfactory. Oh, I ran my ongoing campaign, set in the world I created back in 1982, using those rules, and things went along well enough. But there were things that just felt wrong. I could give an exhaustive list, if I felt like racking my brain long enough (remember, I last played with these rules around 2007), but I’m not going to that much trouble. Rather, I’ll point out the one thing that really stood out to me. I could have messed around with the numbers, sure; but it was by far simpler to switch back to the classic 1d6 roll to open a door. Each bonus was worth 16.7% instead of 5%, and the adjustments were very obvious. I wrote down in my last version of Project 74 a new rule that even allowed for changing the die size as an indicator of difficulty. Though it’s not in the BFRPG rules, it’s exactly the method I use now, as it works beautifully. Why didn’t I write it down? See my post on this blog entitled “Metarules” for an explanation of that. It might be tempting to think I’m a true grognard, i.e. a grumbler, one who loves the classic games with a religious zeal. I’m not. I’m working on a game called “Realms of Wonder” right now, a fantasy game set in a world that differs markedly from the kind of world defined by games like Labyrinth Lord or OSRIC, or of course BFRPG. Mechanically the game is a lot like the kind of game Smiorgan seems to want, and I expect it to be a lot of fun… breaking the player’s expectations usually is. I wrote another game, shared on my website but never actually published, called Variant V; it owes more of its DNA to RuneQuest than anything. I ran that campaign for several years. The point is, I like the classic class-and-level games for their own merit, not because they are the only kind of game I want to play. Do I have a point? Yeah, I think I do. Trying to “fix” the classic rules is a mistake. They aren’t broken… they’re just different. This entry was posted in Opinion on February 5, 2015 by Solomoriah. If you’ve been following us on the forums, Google+, or Facebook you’ll know we’ve released a number of things in print recently. Of course, the 3rd Edition of the Core Rules and the Field Guide were the big news, but on Christmas Eve we released David Gerard’s DC1 Tales of the Laughing Dragon, making Dave the third author (after myself and J.D. Neal) to have a multimodule published in his name. So today I updated the print versions of BF1 Morgansfort; most of the changes are just errors that we corrected, but it also contains the adventure-expanding changes that came out of a negative review by Alex on the Cirsova blog (see also the followup post). Let me say that I didn’t just “cave in” and change things because someone didn’t like them… read the long discussion on the forum if you don’t believe me. No, I really saw what Alex was talking about, and was not happy with the results. So I fixed it, and in so doing made the whole Cave of the Unknown better. I also updated the cover of that adventure, going “darker” mainly because that’s the mood I find myself in. I also colorized Nathan Nada’s cover, with his (long ago) agreement; it’s a great piece, and I in no way think I improved it, but I wanted the whole cover to look a bit “richer” if you know what I mean. Finally (for now, anyway), sometime before Easter I have every expectation that we will release J.D. Neal’s JN3 Saga of the Giants in print. It is a GREAT BIG adventure, as big as the Core Rules, and I think it will be one of the best bargains out there. Heck, it’s already free, and that’s a heck of a bargain. There’s more to come beyond that even. Strongholds of Sorcery, by myself, Stuart Marshall, and J.D. Neal, is about 85% complete. I’d love to see in done by next Christmas… it’s a great set of adventures, combining the tricky and very bonkers Castle D’Angelo, the classic horror-movie with some twists that is called House of Coldarius, and the strangely deadly Tower of Light. And there is the ongoing development of Adventure Anthology 2. AA1 has proven surprisingly popular, but then I should have known that a book of short adventures would be well received. Everyone needs a fill-in here and there, and that’s what the Adventure Anthology Series is all about. We’re still looking for submissions for the second book in the series. Join us, and jump in! This entry was posted in Promotion on December 30, 2014 by Solomoriah.